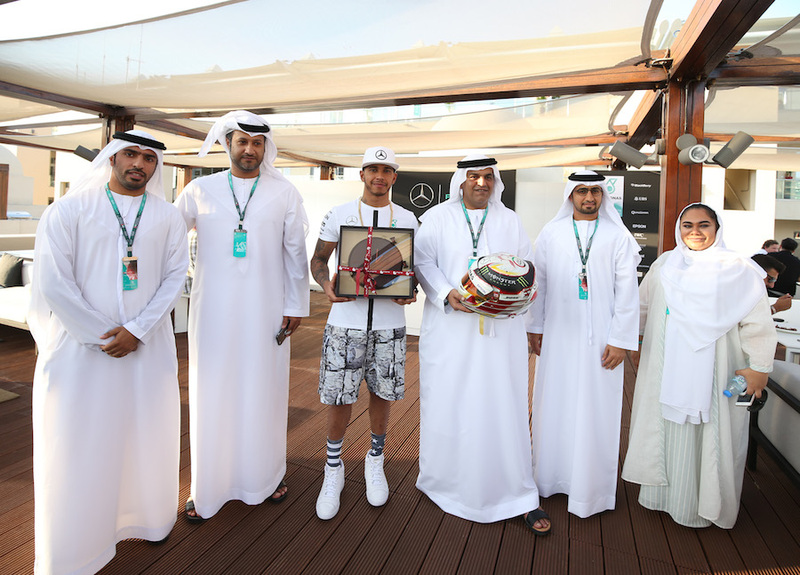 Lewis Hamilton presented a replica of his race helmet with ‘44’ branding to the Acting Director General, TCA Abu Dhabi, HE Jasem Al Darmaki, ahead of the 2015 FORMULA 1 ETIHAD AIRWAYS ABU DHABI GRAND PRIX at Yas Marina Circuit. Hamilton has been heavily celebrating the 44th UAE National Day on his social media channels and has felt very at home at Yas Marina Circuit this weekend. The number ‘44’ appears on the Abu Dhabi Motorsport Management (ADMM) HQ building, which sits alongside the longest straight on the Formula 1® calendar.